The future of shopping has arrived, and it's not human. Not only do robots cost less than humans, they don't complain, they speak multiple languages, and most importantly, by scanning aisles they know where every item is in the store and can take you straight to it. OSHbot is the newest member of the "Fellow Robots" family, and developed in partnership with Lowes Innovation Labs. OSHbot incorporates the latest of these advanced technologies. For example, a customer may bring in a spare part and scan the object using OSHbot’s 3D sensing camera. 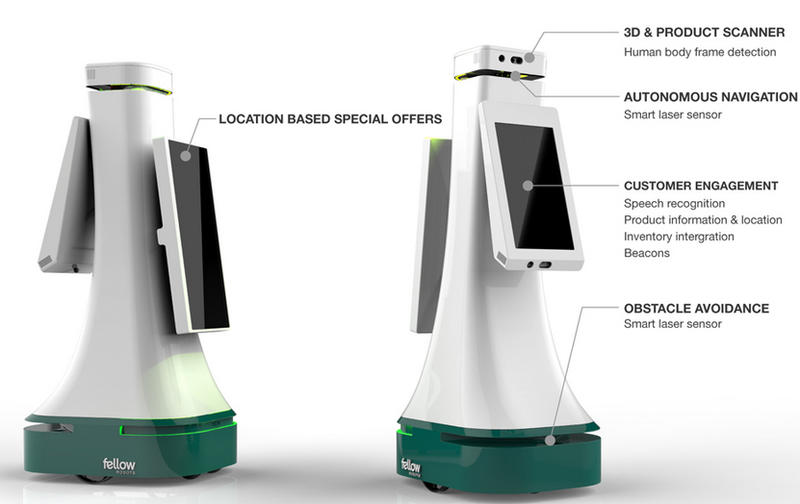 After scanning and identifying the object, OSHbot will provide product information to the customer and guide them to its location on store shelves. The robot will come up to you and say in a pleasant tone "Hello I am OSHBot, your store robot helper. What can I help you with." Show OSHbot a screw, and OSHbot will scan the item and take you to the exact match, or tell you if it's out of stock. Not even the most knowledgeable human clerk can do that. The following video explains everything you need to know. It's well worth a play. Would you rather deal with an associate who may be unfriendly and typically does not know where things are, or OSHbot? I would take OSHbot 7 days a week. I suspect so would most. And even if you wouldn't, it's guaranteed to happen anyway. Robots do not complain, they show up on time, they want to help, they don't ask for overtime, and they do not need medical insurance, Social Security, or pensions. All of the greeters and helpers at WalMart, Lowes, Home Depot, Target, and retailers in general will give way to "Fellow Robots". And that will happen sooner than anyone realizes. OSHbot, competition, and technology in general are inherently price-deflationary. With that thought, I suggest that the Fed, Central Banks, and Governments are on a failed mission. Sure, they can raise the minimum wage and engage in inflationary policies, but they cannot halt the march of technology and create jobs at the same time. Every hike in minimum wages or healthcare subsidies is an extra added incentive for corporations to use hardware and software robots. Asset bubbles of increasing magnitude over time coupled with rising income inequality is a direct consequence of inept central bank deflation-fighting exercises. For further discussion please consider Challenge to Keynesians "Prove Rising Prices Provide an Overall Economic Benefit". The next asset bust, as well as the Fed's response to it, are likely to be spectacular. A few interesting comments came within minutes. Here are a couple of them. Gordon writes "This is great for the mom and pops of the world but ask the robot about the hammer and what actually works instead of just trying to sell someone a hammer and it cannot tell you." Jon responds: "Good catch. I can't tell you how many times I've gone to Lowe's or Home Depot with a DYI project and the guy walked me around and told me how to do the same thing at half the cost that I budgeted. All at the expense to the company's margins of course. But those dudes are the best." My reply: Robots will never replace everyone, just a huge portion of such workers. Moreover, and over time, these robots will get smarter and smarter, complete with how-to videos.